Grew Up… as Harry Longabaugh. 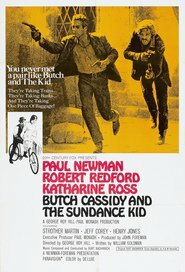 The Sundance Kid got his nickname from a ranch in Sundance, Wyo., where he stole a gun and a horse. Profession… robber. The Sundance Kid is arguably the most valuable asset to the Hole in the Wall Gang, seeing as he’s the only one who can actually hit anything with his bullets. Butch reveals at the most inopportune moment that he’s never shot anyone before, putting even more pressure on Sundance to save the day once again. Interests… his gun. Sundance is quick to draw and deadly accurate when he shoots. But his favorite pastime is probably heckling Butch. When Butch blows the heck out of a train car with too much dynamite, Sundance teases, “Think ya used enough dynamite there, Butch?” In the end, though, he’d stick with Butch until both of them are dead. Relationship Status… single. Though he frequents local brothels, he can’t help but love Etta Place, a schoolteacher who’s got the heart of a lioness. She knows he’s trouble, but she can’t help loving him either. The two are made for each other. And she’d follow him to the ends of the earth if it meant they could stay together, ideally out of trouble with the law. Personality… introverted. Sundance is usually reacting to something Butch throws at him. Otherwise, he enjoys taking in the scenery, keeping his hat brim low, and smoking a little tobacco. The simple life appeals to Sundance almost as much as the life of a gunslinger…but not quite. The Sundance Kid's popularity ranking on CharacTour is #4376 out of 5,000+ characters. See our top-ranked characters and read their profiles.